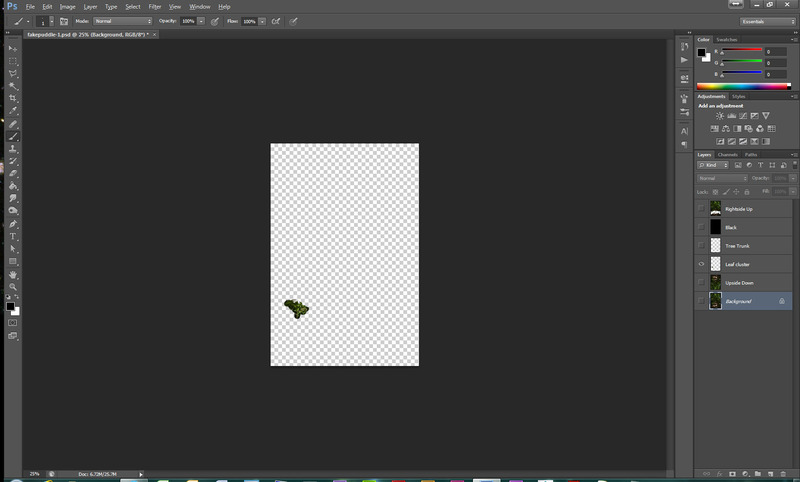 This is similar to my previous tutorial but requires a bit more than simply flipping an image and distorting it a bit. 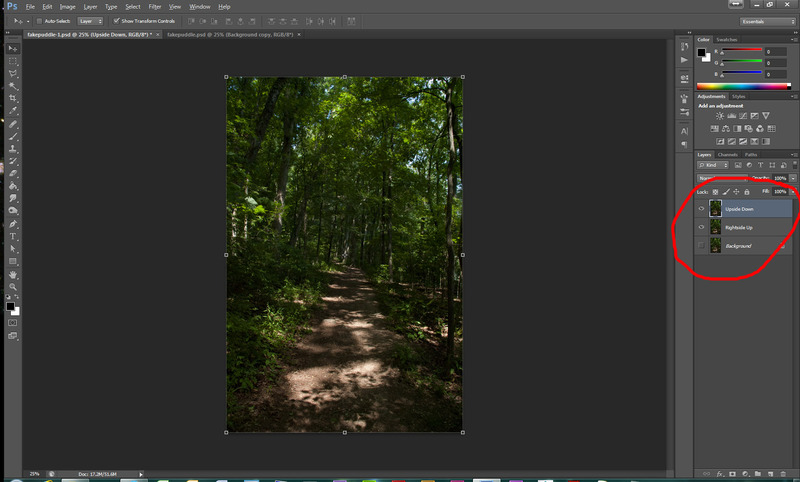 Again, I’m using PhotoShop CS6 on a Windows 7 Pro 64-bit computer. I’ll be using a Wacom Bamboo Fun CTE-650 which is somewhat larger than the standard 5 x 7 graphics tablet. 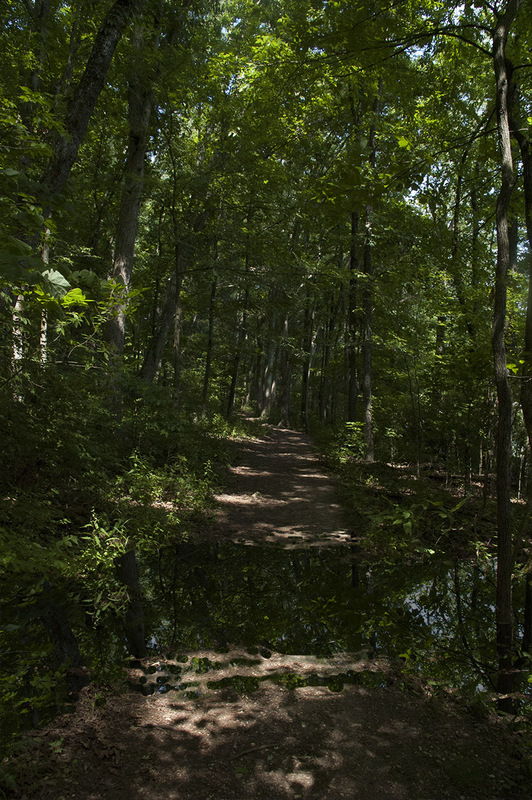 We start out with this image, which you can download HERE if you like. 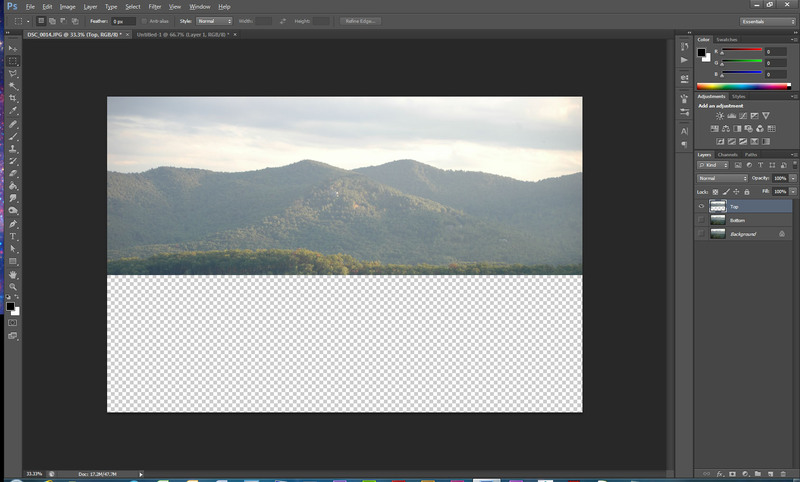 Load the image into PhotoShop and make two duplicates (right-click on the layer, select Duplicate Layer), then hide the “Background” layer by clicking on the Eye. Remember rule number one: never work on your original photo. Always work on a copy. Make the right-side-up copy the active layer. Using the eraser, cut out some of the ground, making a somewhat random, blobby shape. Be careful about cutting trees in half, as that will spoil the illusion. Now, unhide the upside-down version of the image and place it beneath the one with the erased areas. 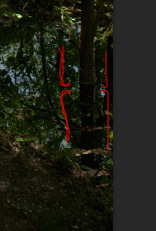 Notice that no dragging downward is really needed, it lines up pretty well (in this example. If you choose another image to work on, you may have to drag downward). 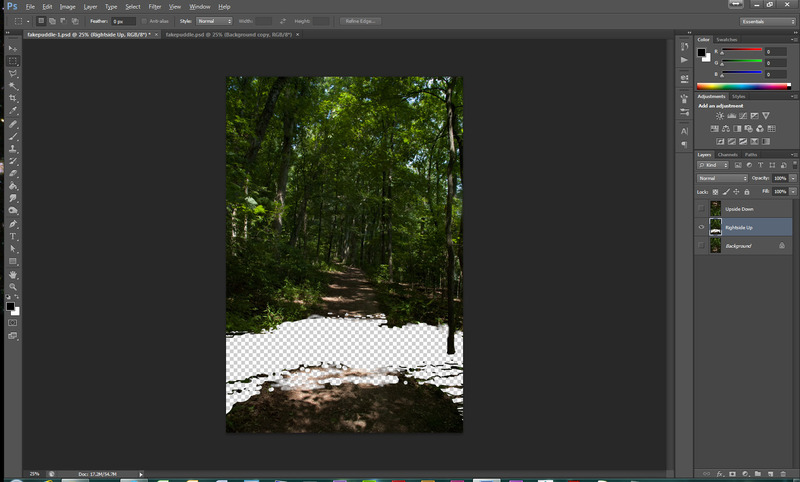 Now, create a new layer, use the Paint Bucket tool to fill it with black, and set the opacity down to 45. Place it between the right-side-up image and the upside-down one. 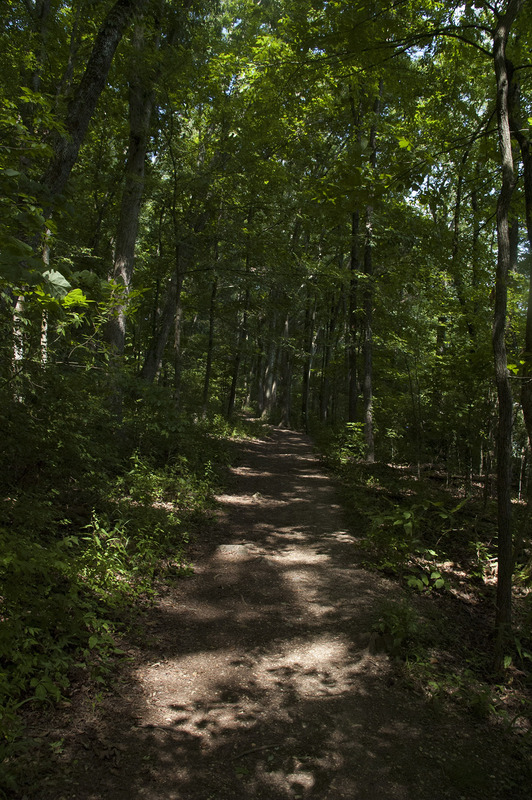 This makes the lower layer a bit darker, as you might expect in an area with a lot of trees. –doesn’t cast a reflection! Argh, run, it’s a vampire! Just kidding. It’s not a vampire, you can come back, seriously. 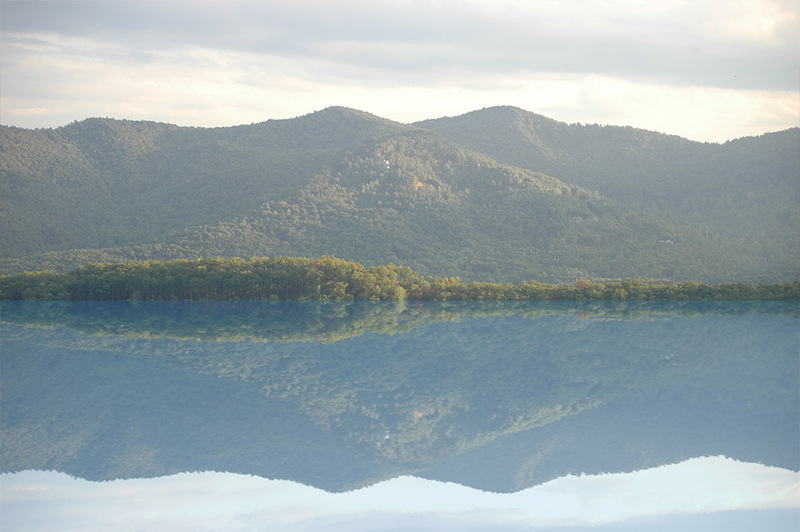 Anything that stands out near the artificial water will have to be copied, flipped, and placed into the image. I like using the Quick Mask for this. Just press Q, then choose the Paint Brush, and paint over the leaf cluster. Press Q again to see selection. NOTE: You may have to go to Select, Inverse to grab the leaves, instead of everything but the leaves. Then copy, paste into a new layer, and place this layer below the black layer. I’ve hidden all other layers below to give a better picture of the leaf cluster. 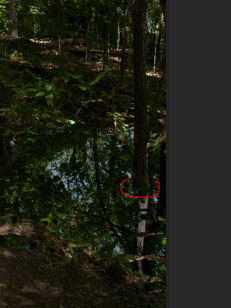 This tree over on the right also needs to get a reflection, at least of the trunk where it meets the water. We use the same steps as previous–select, copy, paste into new layer, flip vertically, and place below the black layer. You’ll have to align them so that they “look good” to your eye, there’s no settings that I can give you for this. Any comments, suggestions, improvements or anything else you’d like to share, please feel free, and thank you for stopping by. Here’s an extremely quick way to add a waterline to a photo. 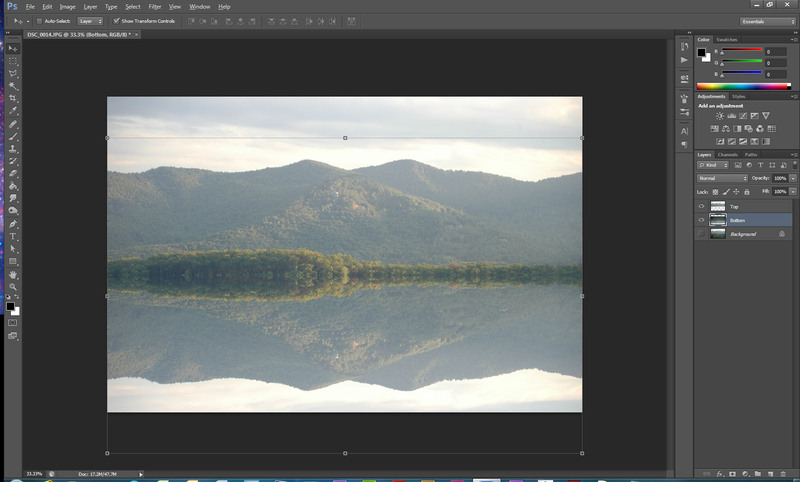 I’ll be using PhotoShop PS6 on a Windows 7 Pro 64-bit computer. Although I usually use a Wacom graphics tablet, for this tutorial it isn’t necessary. We start out with the image below, which you can download if you click on THIS. 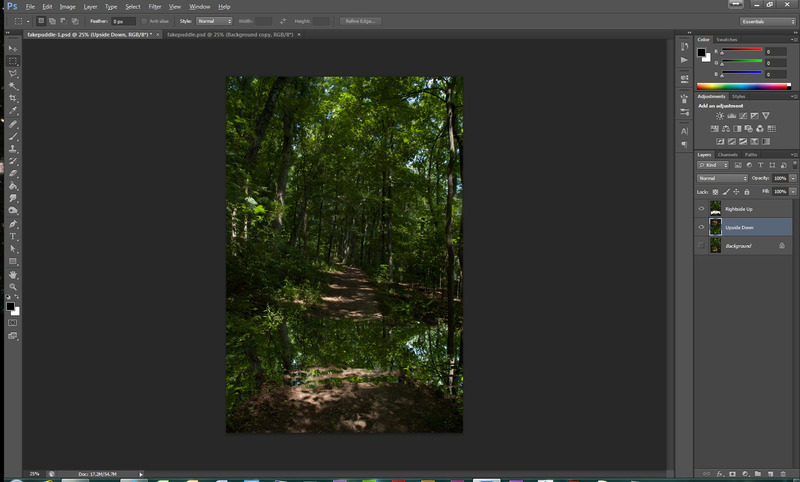 We load this into PhotoShop, and then the very first thing we do is duplicate it twice. Rule number one: NEVER work on your original image, always work on a copy. 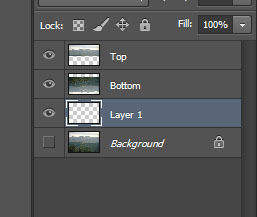 You can name the duplicate layers anything. 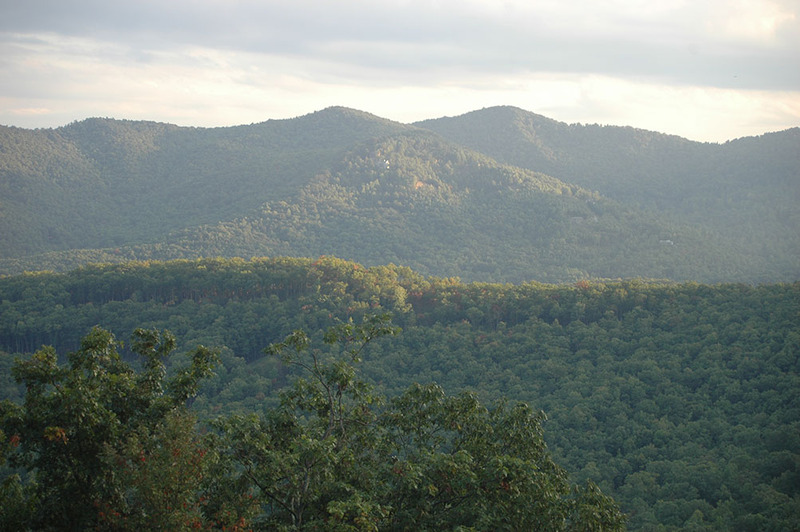 Here I’ve chosen “Top” and “Bottom.” The Top will be the mountains, and the Bottom will become the lake. Make the Top layer the active one. Using the Rectangular Marquee tool, select an area of the bottom half of the picture. 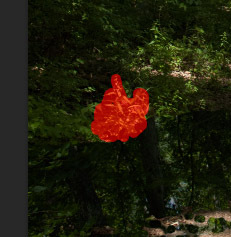 In this case, we want to remove this area, especially the foliage closest to the camera. 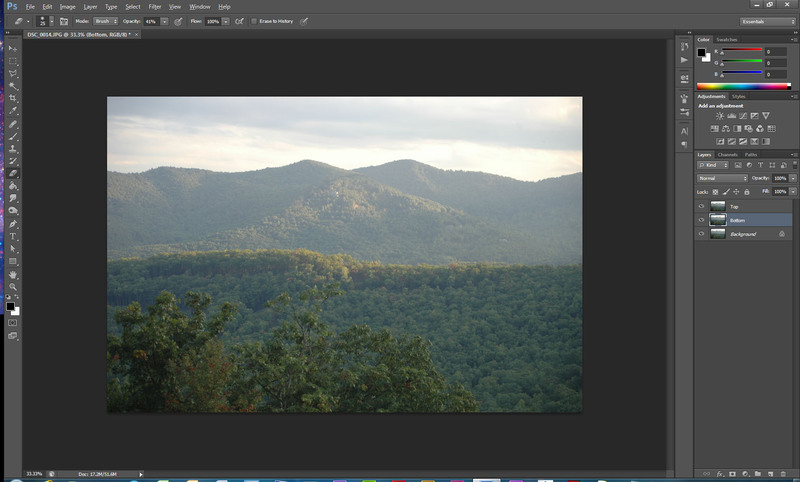 Once you’ve selected the area, delete the image in the box by pressing CTRL-X (on the Mac, I believe it’s Command-X). 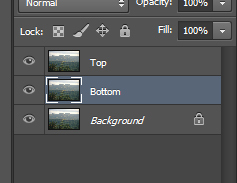 In the image above, you’ll notice that I’ve hidden the other layers. This is just because without “Bottom” being hidden, it doesn’t look as if anything has happened. 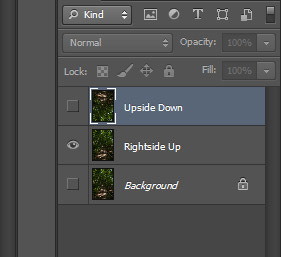 Go to the EDIT menu, and choose TRANSFORM, and then choose FLIP VERTICAL. 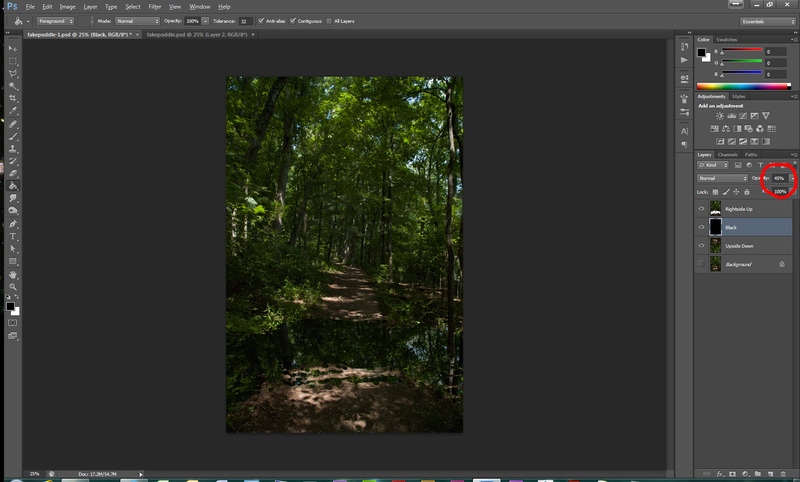 Using the Move tool, pull the Bottom image straight down until it matches the edge of the Top image. Now that we have our lake, let’s mess with it a bit. First, create a new layer. For the moment, it doesn’t matter where it’s located. 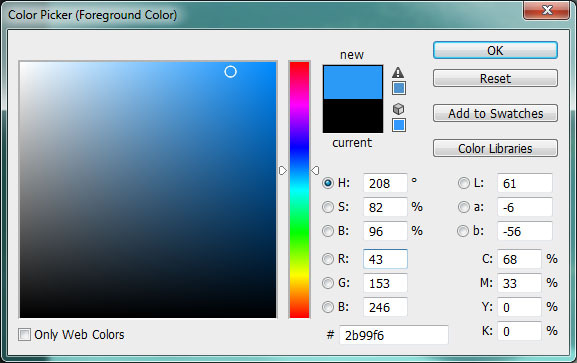 Click on the color picker and choose a color you like to make the Bottom image look a bit watery. I chose a somewhat warmer blue. 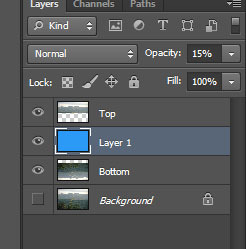 Click on the Paint Bucket Tool and, making sure your new layer is the active layer, fill it with blue. 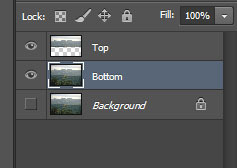 Move the layer between the Top and Bottom layers, and give it an Opacity level of 15. In the image above, I applied a Filter to the Bottom image. 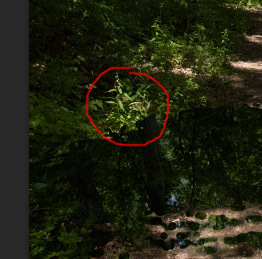 I used the Filter – Blur – Motion Blur, with the angle at 0 (zero) and a distance of 8 pixels. To be honest, I’m not really crazy about the blur, but I felt it needed something to help the illusion along. If you come up with a better idea or a different setting, I’ll happily give it a shot and give you the credit. Thanks for stopping by, and happy image-making.